Almond Pudding Cookies – Have you seen Million Dollar Rooms on HGTV? It’s a show where they showcase (you guessed it) rooms that cost a cool mil to build. Because, you know, spending a million dollars on a room is totally reasonable. Now, I can kinda understand spending that much on, say, a pool area. Maybe a garage or media room. Pools and movie equipment are expensive, especially by rich people tastes. But last week I saw an episode that included a million dollar closet. Yes, I just said a million dollar CLOSET. That, it turns out, is worth at least five million dollars if you include the contents. Because the closet was inspired by Coco Chanel. And, as the owner of the closet points out, Chanel purses ain’t cheap. Neither, apparently, was the $30,000 18-karat gold chandelier. Or the $10,000 rug with the Chanel logo. Or the hand-crafted wrought-iron staircase (yes, I said staircase; for the two-story 48,000 square foot closet) copied from the mirrored Chanel staircase in Paris. She really wanted to do mirrors on her stairs, but she couldn’t get them to bend, darn it. What a waste. Of course, the closet has more space than she needs right now. “I need to go shopping!” she chuckles. But hey, she lets people take tours of the closet for charity. Gotta give back, right? Want to see something that doesn’t cost a million bucks? 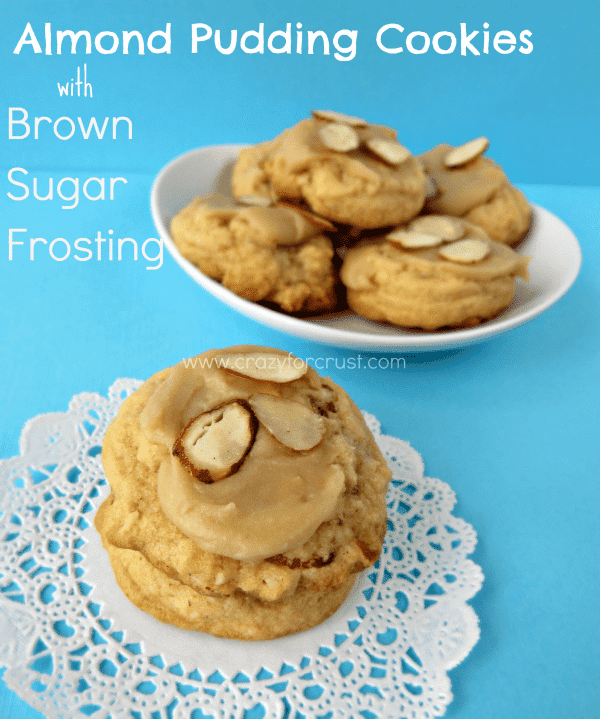 Almond Pudding Cookies with a Brown Sugar Frosting. Is there anything in that sentence that doesn’t sound good? I made these Almond Pudding Cookies for a friend who helped me out a lot when my parents were sick. She loves almond and almond extract and had given up chocolate for lent. I did some searching and came up with this recipe. They are the perfect “thank you” cookie. They’re soft and chewy, sweet and almondy. If you like almonds, this recipe is for you! 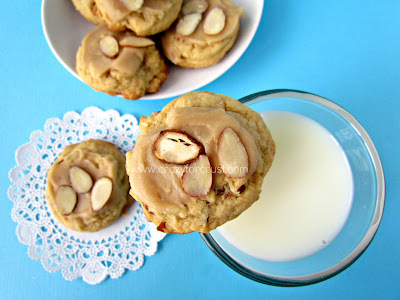 These Almond Pudding Cookies are totally worth a million bucks for a fraction of the price. Be sure to check out all my pudding cookie recipes! Cream together butter and sugars. Add the pudding package and beat until well blended. Add eggs and almond extract. Slowly add the flour and mix until just combined. Stir in almonds. Roll into 1” balls and place on your cookie sheets. Bake for 10-12 minutes. Cool completely before frosting. To make the frosting: combine the brown sugar, milk, and butter in a saucepan over low heat. Stir until the sugar is completely dissolved into the liquid, just a few minutes. Remove from heat and add almond extract and powdered sugar. Stir until no lumps remain. Frost cookies quickly; this frosting tends to harden fast. Top immediately with toasted almonds and let the frosting harden. 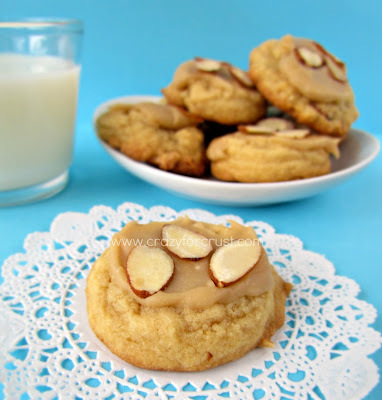 Enjoy your Almond Pudding Cookies! It’s funny what people think they need, like a million dollar closer. Yikes! I can think of a few other things to do with a million bucks, like pay off my mortgage and fund the RESP’s for the kids. Thanks for sharing your treats at Scrumptious Sunday, you’ll have to have me over for some (sadly my hubby is allergic to almonds so I can’t try your recipe, as much as I would love to!!) have a super night! Thank you for linking up this lovely project!!! This week’s linky party is up, i would love you to stop by and link up another fabulous project….